Riots break out in Newark, New Jersey. 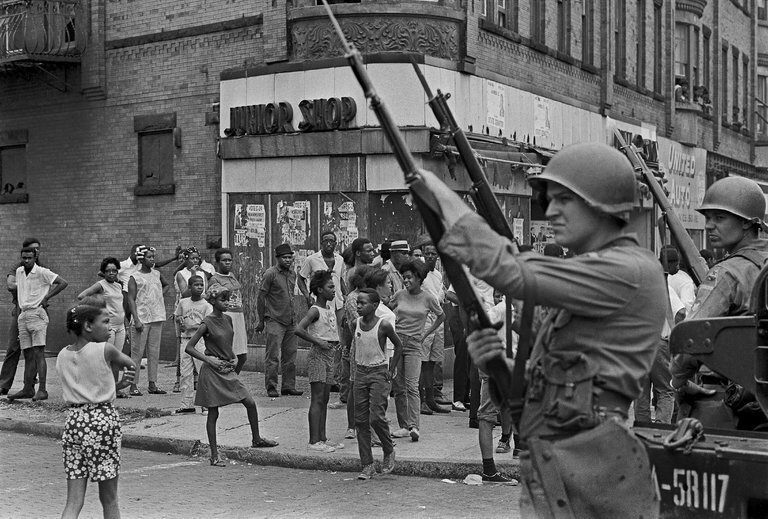 The 1967 Newark riots was one of 159 race riots that swept cities in the United States during the “Long Hot Summer of 1967”. This riot occurred in the city of Newark, New Jersey between July 12 and July 17, 1967. 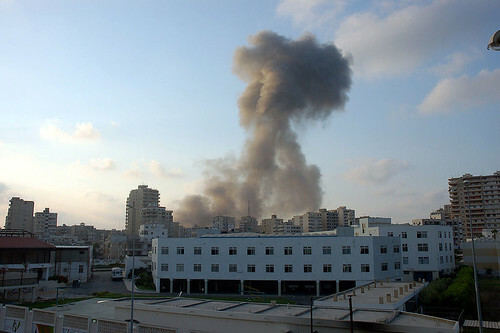 Over the four days of rioting, looting, and property destruction, 26 people died and hundreds were injured. In the decades leading up to the riots, deindustrialization and suburbanization were major contributors to changes in Newark’s demographics. White middle-class citizens left for other towns across North Jersey, in one of the largest examples of white flight in the country. Due to the legislation of the Servicemen’s Readjustment Act of 1944, white veterans, who had just returned from fighting in World War II, began to emigrate from Newark to the suburbs where there was improved access to interstate highways, low-interest mortgages, and colleges. The outflow suburban sprawl of white veterans from Newark was rapidly replaced with an influx of blacks moving into the Central Ward; the blacks, however, faced discrimination in jobs and housing, ultimately making their lives exponentially more likely to fall into a cycle of poverty. By 1967, Newark was one of the United States’ first majority-black cities, but was still controlled by white politicians. Racial profiling, redlining, and lack of opportunity in education, training, and jobs led the city’s African-American residents to feel powerless and disenfranchised. In particular, many felt they had been largely excluded from meaningful political representation and often subjected to police brutality. Unemployment and poverty were very high, with the traditional manufacturing base of the city having been fully eroded and withdrawn by 1967. Further fueling tensions was the decision by the state of New Jersey to clear tenement buildings from a vast tract of land in the Central Ward to build the new University of Medicine and Dentistry. Thousands of low-income African American residents were displaced at a time when housing in Newark was aging and subjected to high tax rates. Many African Americans, especially younger community leaders, felt they had remained largely disenfranchised in Newark, despite massive changes in the city’s demographic makeup. Mayor Hugh Addonizio, to date the last white mayor of the city, took few steps to adjust to the changes and provide African Americans with civil leadership positions and better employment opportunities. Despite being one of the first cities in the country to hire black police officers, the department’s demographics remained at odds with the city’s population, leading to poor relations between blacks and the police department. Only 145 of the 1,322 police officers in the city were black, mirroring national demographics, while the city grew to be over 50% black. Black leaders were increasingly upset that the Newark Police Department remained dominated by white officers, who would routinely stop and question black youths with or without provocation. The Newark riots of 1967 were in response to an incident of excessive force where two Newark Police officers arrested and beat John Smith an African American taxi driver. The riots in Newark occurred 2 years after riots in Los Angeles and came at a time when racial tensions were high. Historians believe that the shrinking of the economy, increased unemployment, and a city with a majority African American population which was being run by white politicians increased tensions during that era. This unrest and social change came to a head when two white Newark police officers, John DeSimone and Vito Pontrelli, arrested a black cab driver, John William Smith, on the evening of July 12. After signaling, Smith passed the double parked police car, after which he was pursued and pulled over by the officers. He was arrested, beaten by the officers and taken to the 4th Police Precinct, where he was charged with assaulting the officers and making insulting remarks. Residents of Hayes Homes, a large public housing project, saw an incapacitated Smith being dragged into the precinct, and a rumor was started that he had been beaten to death while in police custody. Smith in fact had been released in the custody of his lawyer. The rumor, however, spread quickly, and a large crowd soon formed outside the precinct. At this point, accounts vary, with some saying that the crowd threw rocks through the precinct windows and police then rushed outside wearing hard hats and carrying clubs. Others say that police rushed out of their station first to confront the crowd, and then they began to throw bricks, bottles, and rocks. A person who had witnessed the arrest of Smith contacted members of the Congress of Racial Equality, the United Freedom Party, and the Newark Community Union Project for further investigation; they were subsequently granted access to Smith’s 4th Precinct holding cell. After seeing the injuries Smith sustained from the police, they demanded him to be moved to Beth Israel Hospital in Newark, New Jersey, and were granted their request. At least five police officers were struck by stones, according to one officer. Some residents went to City Hall and shouted angry protests. After midnight false alarms caused fire engines to race around a six-block area along Belmont Avenue. Looters smashed windows of a few stores and threw merchandise onto sidewalks. According to police, liquor stores were the main target of looters. As the rumors were dispelled, things calmed. The Turaymisah massacre kills 250 people during a Syrian military operation in a village. The Australian Aboriginal Flag is first flown. The Rolling Stones perform their first concert. At the Marquee Club in London, the rock band, Rolling Stones perform their first concert.